Are you looking for Carpenter Bee Control in NJ? ALCO Animal & Pest Control offers prompt, professional and safe Carpenter Bee Control in NJ since 1995 for many satisfied clients. Whether it is residential or commercial Carpenter Bee Control , ALCO Animal & Pest Control will solve your Carpenter Bee problem in no time. 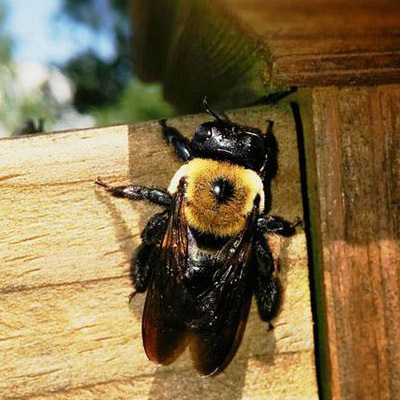 Our trained and experienced NJ Carpenter Bee Control technicians are qualified to handle a variety of Carpenter Bee situations and can rest assure to restore your normal life, keep you, your children, or your employees safe and keep you in line with state and local animal laws. ALCO Animal & Pest Control uses environmentally friendly Carpenter Bee Control products as well as humane Carpenter Bee Control methods to keep you and your children safe while performing the Carpenter Bee Control job. Our knowledgeable pest technician will answer any questions you may have and explain to you every detail you need or want to know about the job. We are always friendly and we are here to help. Carpenter Bees have a wide appearance throughout the United States. There are so many different species of bees in the US, but one of the most prevalent is a big bee that resembles a bumble bee. Expect to find these bees, if you haven't already, circling around flowers and shrubs and under the eaves of buildings. They are unique because its home isn't always a bee hive, but can be a piece of wood that they bore through, thus giving them the name carpenter bee. For this reason they can be bad news when it comes to property consisting of wood material. Bees aggressively guard their homes and their nesting areas from intruders and any other possible harm. If you suspect these insects around your home, it's not a good idea to try getting rid of them yourself. How can I tell if there are bees if I don't see them? They bore holes into wood overhangs, fence posts, and trees. It's important for people to understand that bees aren't out to get them; they just want their homes respected and their eggs and food safe. Bees spend days gathering food and keeping it near their eggs at the edge of the hole in the wood. What flowers do they like most? Females get their food from flowers once they have completed drilling their nest. They will spend days foraging for food. You may find the females working Azaleas, Bradfords, Daffodils, Pansies and any plant which will provide pollen. Males hang around flowers like the ones mentioned looking for a mate. But, males are curious and will buzz around people. This buzzing scares people into thinking they are being "attacked". They are in fact rarely aggressive unless they feel threatened. They might start to feel this way if you become shocked by their buzzing, so try to stay calm and both you and the bee can remain unharmed. ALCO Animal & Pest Control provides full removal and control services in NJ. We are more than happy to inform New Jersey and out of state visitors on these and other species that (might) cause dangers to their health. 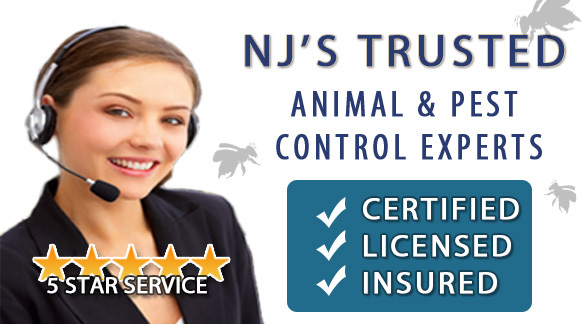 We offer great advice and solutions because we are certified and well informed when it comes to animal control and the safety of animals in New Jersey. That is our main priority. Contact ALCO NJ Pest Control Now Call us today at (862)220-5297 for same-day pest control and animal services for homes and offices located in New Jersey.